In celebration of actually completing this month’s (by which I mean April’s) 2014 Smalls SAL challenge, I’m letting my inner Anglophile out to play. To be truthful, my inner Anglophile isn’t exactly usually inside the house practicing her violin and doing her math homework. She’s usually out cavorting around for everyone to see — watching BBC America, reading nineteenth-century English novels, eating lemon curd, indulging in a mild fascination with Prince Harry, driving on the left side of the road (OK, maybe not that last one). 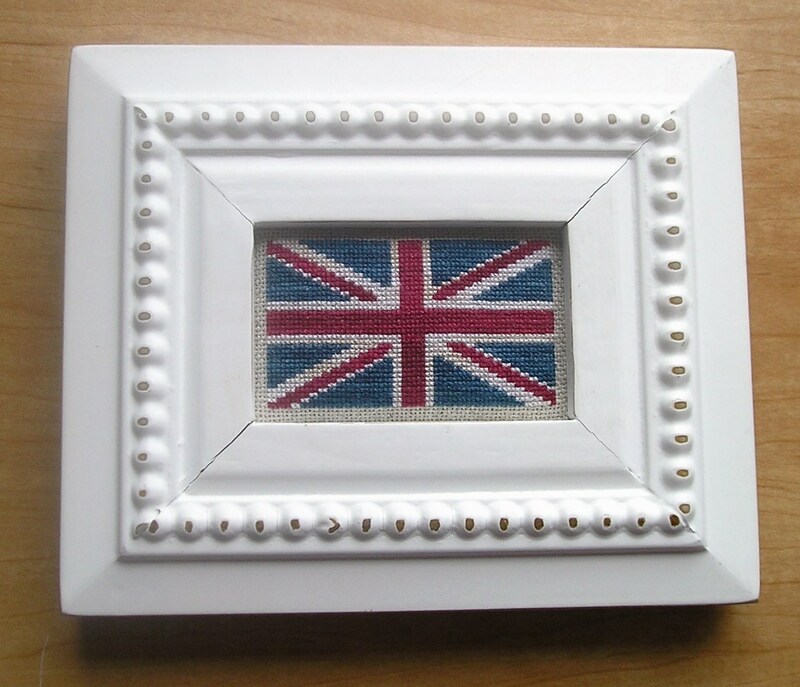 I charted and stitched “Union Jack Freebie” (last seen as a work-in-progress here) for my fledgling — very fledgling — cross stitch design company, Wordsmith Designs, and the charted design will be up on the web site soon. However, it’s already available on this blog here as a free pattern. To give you some idea of the scale of this design, the entire frame is only 6″ X 4 1/2″/15 X 11.5 cm, and the design size itself is 2.52” X 1.4”/6.4 X 3.55 cm. I stitched this Union Jack on 25-count beige Jobelan, which is my current favorite fabric for doing one-over-one designs; the stitch definition is fantastic and it’s not too tiny (and exasperating) to work with considering my middle-aged eyes. The threads I chose were Gentle Arts Sampler Threads in Midnight (blue), Schoolhouse Red (red) and Oatmeal (ecru/white), although the pattern comes with some alternative suggestions (DMC, Anchor, Crescent Colours and Weeks Dye Works). I’ve tried to be as accurate to the real Union Jack flag as possible. The tricky parts were the diagonal red lines which do not quite line up in the original, although many reproductions “cheat” by having simple diagonal lines. The frame is a standard 2″ X 3″/5 X 7.5 cm frame I found at (I believe) Target several years ago. The cracks at the joins don’t appear so alarming in real life as they appear in this photo. It’s funny how photographs magnify even minor flaws. I’ve noticed this phenomenon when photographing knits before; the slightest imperfection — a knot in the wrong place, a stitch that sticks out, a stray cat hair — shows up like it’s got a huge neon arrow pointed at it. Photography issues aside, I hope you enjoy this quick and easy pattern. I’d love to see any pictures of completed projects.